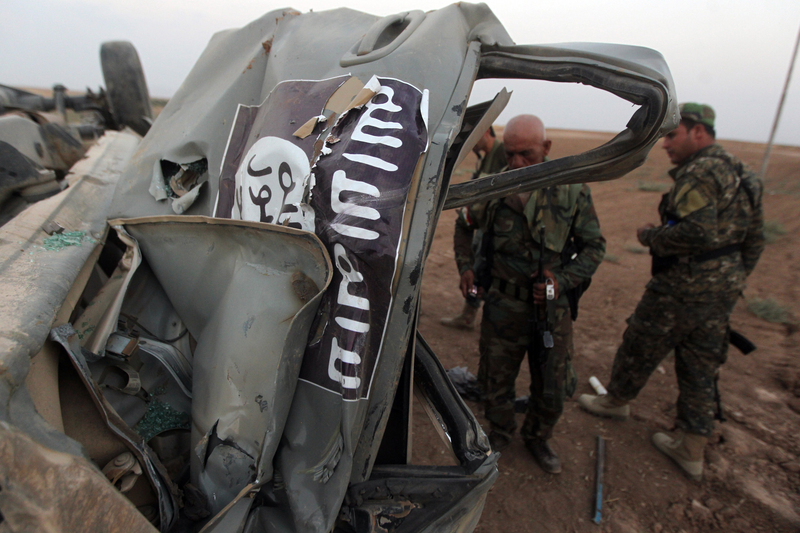 Since U.S. troops withdrew from Iraq in 2011, fighting has again flared up there. Not only has Iraq continued to experience internal conflict, but the civil war in neighboring Syria has also spilled over Iraq’s northern border. At the center of the renewed warfare is an extremist terror group called the Islamic State, or ISIS (Islamic State in Iraq and Syria). (See more about the group’s name below.) Made up of Sunni militants, ISIS formed from the remnants of the group Al Qaeda in Iraq, which had been largely destroyed. The rapid advance of ISIS forces across northern Iraq this summer caught many by surprise—as did their brutality in driving thousands of Iraqis from their homes under threat of death. They targeted Iraqi Christians and later brutally murdered foreign journalists being held hostage. As ISIS gained territory and spread terror, the Iraqi army proved unable to stop it. Meanwhile, the terrorist group amassed weapons abandoned by the Iraqi military. In August, the Obama administration decided to act militarily, with the announced goal to “degrade and ultimately destroy” ISIS. The president ruled out putting American “boots on the ground,” though small numbers of U.S. Special Forces are engaged in coordinating airstrikes. U.S. bombs have targeted ISIS strongholds in Syria as well as Iraq. The effort to counter the terrorist group involves a side debate over what exactly to call it. President Obama used the acronym ISIL, for Islamic State in Iraq and the Levant. In Arabic, the group’s name includes “Syria” but in the sense of “Greater Syria,” meaning a larger area than the present nation of Syria. The term Levant is another historical term for a broader, indefinite area encompassing much of the Eastern Mediterranean west of Iraq. ISIS has ambitions to establish a caliphate, or Islamic state, and does not respect existing national borders. This article gives an account of how the ISIS was until recently underestimated by the Obama adminstration. ISIS, ISIL or Islamic State: What’s in a Name? This article discusses the various terms being used to describe the terrorist group known as the Islamic State, or ISIS, or ISIL. This article presents a brief interview with former secretary of defense and head of the CIA Leon Panetta on the threat of ISIS. This interactive map shows how the terrorist group known as ISIS came to control large swaths of southern and eastern Syria and northern Iraq along the Tigris and Euphrates Rivers. This article explains various uses of the term “Greater Syria” (or Bilad ash-Sham) and the historical background of the region; includes links to a variety of articles on Syria, from prehistory through the Umayyad Caliphate to modern times. i do not think iraq can sustain themselves through the two wars they are fighting in as of right now… i think. This is not cool…This is dangerous I don’t think its safe. ALL MUSLIMS ARE NOT TERRORISTS! GET THAT IN YOUR HEAD PEOPLE!!! The Article Addresses the terror threat of a group known as ISIS built from the remains of the former terrorist group Al Qaeda. In The Second paragraph it mentions that ISIS drove people out of their homes threatening them to death. Also holding hostage foreign journalists and later killing them. I believe that sending in drones and dropping bombs is not the answer to stopping ISIS because bombing them would kill innocent lives. i understand that the violence needs to be stopped but i believe it should be handled in a more civilized manner. if it continues then push comes to shove you will have to drop a bomb to stop it. I believe that the main issue in this would be that they caught us by surprise. Which is a great advantage but not the best. The diplomacy that you are using, Moral Diplomacy(The effort to counter the terrorist group/U.S. bombs have targeted ISIS strongholds in Syria as well as Iraq), In my opinion is the correct one to use. You are doing what is needed but for the right reason. We, the people, can’t oppose to that(doing the right thing). If i were in your position, I’d probably be taking the same actions as you are, Mr.President, because like i stated earlier in the text, it’s for the right reasons and for the safety of our people. Dear President Obama, as the terrorist group ISIS gets more and more out of hand, the lives of people living in neighboring countries are in danger. It is clear that ISIS has no respect for national borders. By deciding to use military force you are using the big stick diplomacy but for a good reason, which is to get rid of ISIS. The downside of that would be the lives of the soldiers lost in the battle. The use of airstrikes will keep soldiers from entering the war but for how long? I agree with the type of diplomacy you are using because even though you are using force, you are preventing the deaths of more people. I don’t think money or asking for peace will solve this problem. ISIS would have excepted that and not gruesomely killed foreign journalists. They will keeping invading countries and kill more people to get what they want. If they want to use force and fear to do horrible things why can’t we do the same to save others. I think you should keep using force because it is the only way we can ever get rid of ISIS. isis is killing innocent people and taking hostages, i belive big stick and moral diplomacy are being used in this situation. I agree with the actions that are being taken here because isis is killing innocent people that dont deserve to die. If i was in charge i would be using the same diplomacy that is being used today, big stick and moral. This article has explained the problems of how ISIS is currently threatening the innocent lives of not only other countries but their own lands as well. The U.S. is currently using “Moral Diplomacy” in order to do anything to assure the safety of every innocent life that has unintentionally fallen in-between the crossfire. I agree with the current use of “Moral Diplomacy” because it is used to protect lives and help to free those who feel the oppression of ISIS and its use of “Big Stick Diplomacy”. I understand that you are calling airstrikes and taking the actions you are taking. What I think should be done is bomb the suppliers and bomb them. Yes some insentient lives would be lost but haven’t we lost enough. they wont stop so we need to stop it. I may be wrong but thats what I think. Dear Mr. President, I see that ISIS is causing pain and torcher to the weak by threating there lives, making them leave there houses, and mostly targets Christians to murder. The diplomacy that the United States is using moral diplomacy by trying to make peace with ISIS and trying to stop the death from eneceint people. I do agree with the method that the United States is using but to ever end the ISIS bloodshed that is happening then the United States must start using big stick diplomacy. ISIS will not stop till they are dead. ISIS wants to rule in power and by doing soo they are causing death in numbers that is terrifying. The United States must take ISIS down with no mercy. Im not one to tell people how to do their job. However, after reading this article, I find this situation unsettling. Although your action with the airstrikes are debatable, I don’t think Americas diplomacy is to blame here. In fact, I find Americas role in this obsolete, theres no reason as to why were even getting into this in the first place, unless we (America) are trying to save resources. If this was the case, than that would make our diplomacy a dollar diplomacy. On the flip side; were using force, as shown with the airstrikes, which would make it a big stick diplomacy. On the other hand, many people find our place in this conundrum as a moral obligation to protect the innocent people of ISIS. That would mean we have a moral diplomacy. The way I see it, I dont think we should be in this ISIS problem at all. Its putting the people in our country in danger, and its the presidents moral obligation to put the citizens in this country first, and to protect them. If I had to choose of the three types of diplomacy as stated earlier, I think what would show the most would be moral diplomacy. Namely because of the fact that there is no other reason for us to be in this, other than to protect the lives of innocent people. Mr. President, this is just one of a million opinions on this subject, not to be taken to seriously. Thank you. I see that ISIS is causing a lot of problems for all of us.I am glad that you are try to resolve the matter. You are using Big Stick Diplomacy. Big stick Diplomacy is the best one to use becasue this is probably the best one to use. this way when we are trying to reslove this we can also be protecting the people. So I think we should keep with the same type of diplomacy. America has been having troubles with the group ISIS. ISIS has been brutal and inhumane. They’ve hurt innocent people including iraqi christians and foreign journalists. Obama wants to use military force to ultimately destroy ISIS. I believe you, President Obama, are using Moral diplomacy. I completely agree with that type of diplomacy. President Obama isn’t being a bully, he’s simply using force in order to do and accomplish what he knows is right. The Islamic State, or ISIS has been cause so much damage to the Iraq and Syria. They have been blowing up cars and killing innocent people just to gain power. After the U.S. troops withdrew from Iraq in 2011 ISIS has been terrorizing people and killing them just to gain there power back. This is getting out of hand we need to do something to help or stop them form continuing to destroy more then what they have already done. This is a Moral Diplomacy in many way the U.S. has helped keep the peace but has fought may wars to have some peace but, now that ISIS has gain power I think we need to send some troops to have control or have peace for Iraq and Syria. President Obama should use Moral Diplomacy to do something right and help the innocent people who have nothing to do with the things happening and die for no cause what so ever. I wish we could hurry and act now be cause the longer we wait the more they plan and destroy and kill innocent people. So we need to act NOW! I would like to discuss a few issue’s with the type of diplomacy that was used involving Iraq.the big stick diplomacy is what you were doing to Iraq.example for the text:Obama administration decided to act militarily, with the announced goal to “degrade and assimilation of acting military” – but i don’t with your disagree with your choice because Iraq is acting out of control and you have to do what you have to do. Try to not use the big stick diplomacy for the wrong intentions.try to have the mind set of the moral diplomacy in mind. It appears that ISIS is threatening innocent people, stripping them of their rights, and ousting them from their homes by brutal force. The type of diplomacy being used by ISIS is Big Stick diplomacy. I don’t agree with the type of diplomacy being used by ISIS because they are hurting and killing innocent people. I would advise you (Mr. President) to take action with a mixture of Big Stick and Moral diplomacy. You should try and target the leaders of ISIS and not cause harm to innocent civilians of Iraq and Syria. I am not an expert on the situation but i can see that ISIS is using big stcik diplomasy.They are killing and threating hundreds of people.We are also using some type of big stick diplomasy by having bombs on them but we might kill inoccent people. We need to give them a chance to surrender if not we will need to continue are diplomasy to send our troops to destroy the group and end these problems. ISIS is a continuous threat to this nation. They’re collecting weapons from the Iraqi military and are driving the Iraq people from their homes. They’ve already made several attacks in the U.S. and will continue to do so until they are brutally stopped. They will never stop killing until the last one has fallen. I believe that it is very appropriate to have coordinated airstrikes as you have done, but something else needs to be done. Refusing to send in U.S. troops may hinder us in our attacks and will definitely slow down their destruction. These terrorist, Islamic extremist, need to be stopped. Not all Islamics are terrorist and you can’t afford to be so “politically correct” that you can’t even say that. It is sad to see that our country is too afraid of offending anyone that we can’t speck the truth anymore. America as a whole needs to stand up for itself and take control of what is happening. We need to protect ourselves. I dont think its right for people to be killed or taken out of their homes for no reason. I think you should use the big stick diplomcy to help people. I do believe Iraq can be stopped.They are hurting and killing innocent people.I dont think you are wrong for wanting to react militarily because they need to be stopped. The big stick diplomacy is the right diplomacy to choose. ISIS is threatening innocent civilians and should be stopped. They have killed and hurt people in an act to be a new terrorist group. The diplomacy seems to be big stick diplomacy and i agree with using big stick diplomacy. we as the united states need to show ISIS that there threats are not taking lightly so we must find a way to get them out of this threatening state they need to stop thinking there the one in charge when we need to use big stick diplomacy to show we are in charge. the issues of social and economical warfare are to be delt with caution and high expectations that need to be convenced by the people, not just the political parties. We should have word in the world’s debates and possibly have a vote skale factor on whether or not to start war. You never know who you might be dealing with. Think of the domino affect for example. Basically the article is telling how the ISS is being a threat to innocent people, taking away their rights, and taking them away from their homes by brutal force. diplomacy being used is a big stick diplomcy. I think you (obama) should use moral diplomacy. it’ll help and protect the innocent people. its the best thing to do. its doing whats right. it appeared you’ve decided to not take our troops on a mission to get rid of ISIS. Honestly if you aren’t going to send troops you should try to bomb him. If you don’t take action now ISIS will continue to hurt innocent lives. He’s taking over Iraq when we spent so long over their saving there government and lives. ISIS is using big stick diplomacy because he knows no one is stronger enough to fight him back other than the United States. I don’t agree with the diplomacy he’s using. Nor do I agree with the diplomacy the United States is using. The U.S is using moral diplomacy instead of actually doing something. Honestly I would use moral first then big stick if he doesn’t apply with the conditions I give him. ISIS is a big threat to the innocent people, taking away all of there rights, with their brutal forces. if you don’t take action now ISIS will continue to destroy and take innocent lives away from loved ones. The U.S is using m moral diplomacy because he’s being completely honest with his actions and I agree. he’s not being a bully by trying to the right thing and that’s the way it should be done. The main issue in this article is the fact that ISIS is terrorizing and treating innocent people in a brutal and cruel way. They are killing innocent civilians and making the people of their own country suffer and live in fear. Big Stick Diplomacy was used to try to resolve the problem, for example, In August, the Obama Administration wanted to “ultimately destroy and degrade” ISIS and special U.S. forces were targeting airstrikes and planning bomb attacks on ISIS. I don’t agree with resolving this problem with Big Stick Diplomacy because when you add fire with fire, it doesn’t resolve anything. By using violence to stop more violence, well, that’s just going to make matters worse. I believe that Moral Diplomacy should have been used to correct this issue, just simply do the “right thing” like make a peace treaty, or compromise to stop the cruel and harsh treatment. I hope you guys realize that ISIS is not the type of group that likes to be cucivilized. They dont want to bargain, they want to kill. They dont want anything from the U.S. They just wanna kill us mostly christians. Nobody wants innocents killed but there isnt a better way obviously and unless you wanna be gruesomely killed than they are gonna keep going for the best method.